Season ticket holders can celebrate like Marcus Maddison every time Posh score a goal. Photo: David Lowndes. 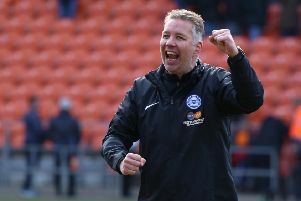 Season ticket holders will gain a cash bonus whenever Peterborough United score a home goal in League One this season. Starting with the Boxing Day fixture against Chesterfield at the ABAX Stadium, season ticket holders will earn 10p in club loyalty cash for every goal Posh score. Season ticket holders must be in attendance to be rewarded. Posh are currently selling ‘half-season tickets’ and purchasers will benefit from the new initiative.